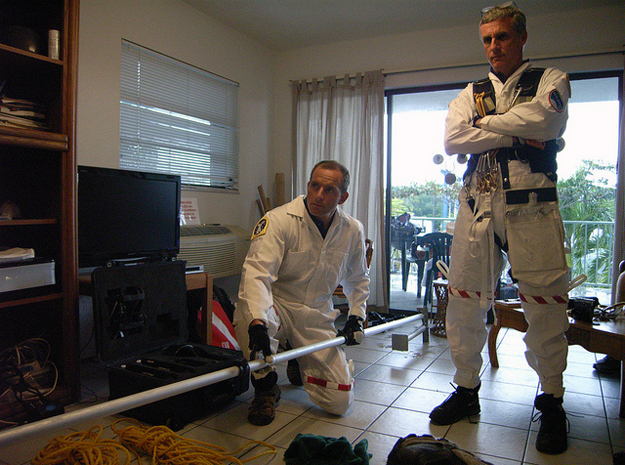 Image at right: The NEEMO 15 Crew performs a simulated behavioral health assessment scenario. The first event began when one of our habitat technicians rushed into the cabin with a red swollen arm. He told us that he had been stung by a jellyfish. After a while, he fainted. It took me some time to realize that this was a simulation scenario which was a part of the behavioral health and performance study. 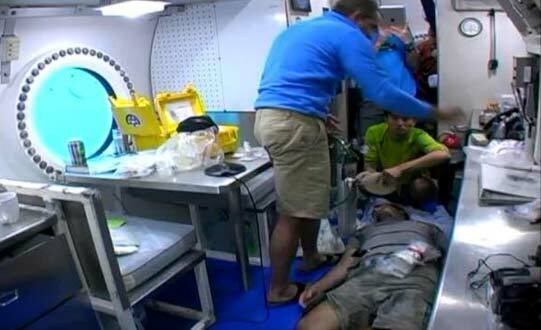 Fortunately we have a crewmember, David Saint-Jacques, who has medical background, so he took the lead to give the patient some treatment with medical kits. 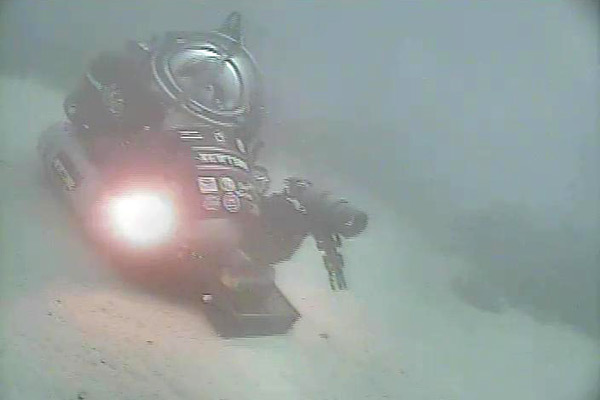 The NEEMO15 commander, Shannon Walker, kept contact with the Mission Control Center by phone, getting some advice from a dive medical officer on the ground. Steven Squyres recorded each step we performed. And I assisted David, following his instruction. We worked fine as a team. We went through the second scenario in the afternoon. This time, the smoke alarm suddenly rang out in the habitat. We were told that the smoke came from the microwave, so we pulled out its power cable. According to the emergency procedure we tried to use oxygen masks in the cabin, but somehow they didn’t work. We were forced to evacuate the cabin and fled to the wet porch. Oxygen masks worked there. It seemed that there was a problem somewhere between the wet porch and the cabin. We looked at a schematic of the air supply/vent system of the habitat. We successfully found the cause, and in the end, the case was closed. Since we might have to deal with some troubles by ourselves during long-distance exploration, coordinating with the ground staff along the way a great exercise. And we demonstrated good teamwork in both cases. 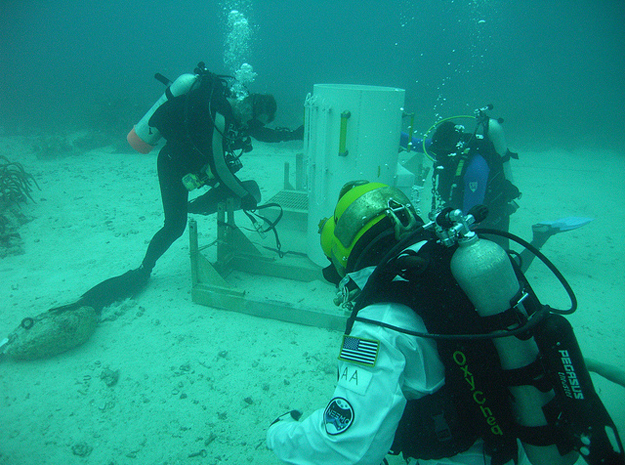 Author NASA Testing for Human Space ExplorationPosted on October 23, 2011 March 19, 2013 Categories UncategorizedTags General1 Comment on NEEMO 15 and Teamwork! 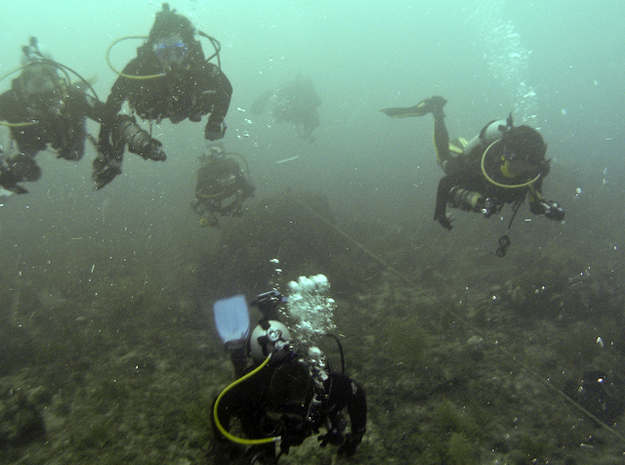 Today was our second mission day in the water. Yesterday was a busy day. I woke up around 5:30 am and enjoyed a wonderful view from the window in our sleeping area for a while. A lot of fish were swimming across the window reflecting an external light of Aquarius. Then another busy day began. We performed two “spacewalks” in two teams today. David and Steve went out first and I supported them from Aquarius. I gave them instructions step by step, and they did a great job performing some tasks like sample collections and deployment of sensors. Each spacewalk has its own objectives, and today’s main objective was to test one of the translation methods which were supposed to be effective on an asteroid surface. We deployed some lines in our working area near Aquarius and used them for translation. After a short lunch break, Shannon and I went out. That was my fourth dive in the SuperLite-17 helmet. I felt I was getting used to it. I could breathe more comfortably than the last time. The translation line seems like a great method. We could easily translate between our sampling locations by pulling ourselves up a line and also create enough ground reaction force to perform tasks. Being in the water for about three hours made me feel cold at the end of the “spacewalk”. One good thing is we have hot shower in Aquarius. I enjoyed it. Though I was too busy to enjoy the window view in the daytime, we have two more hours until we go to bed. I’ll sit at the table and spend some time watching colorful fish from the window. Andrew Abercromby (NASA) and Steve Chappell (NASA) place simulated anchoring and translation equipment across the simulated asteroid surface. 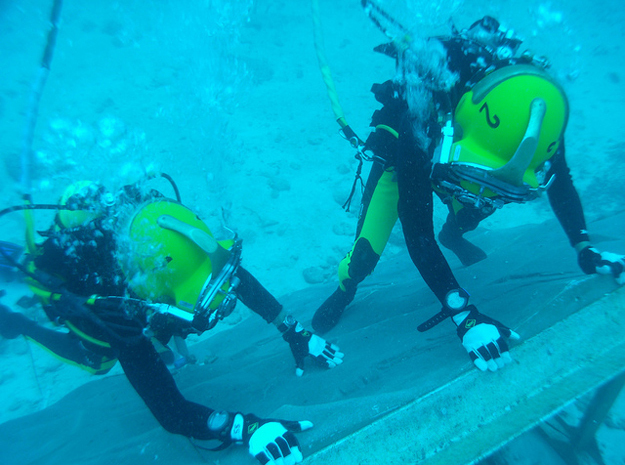 The NEEMO 15 mission is projected to start Oct. 20. 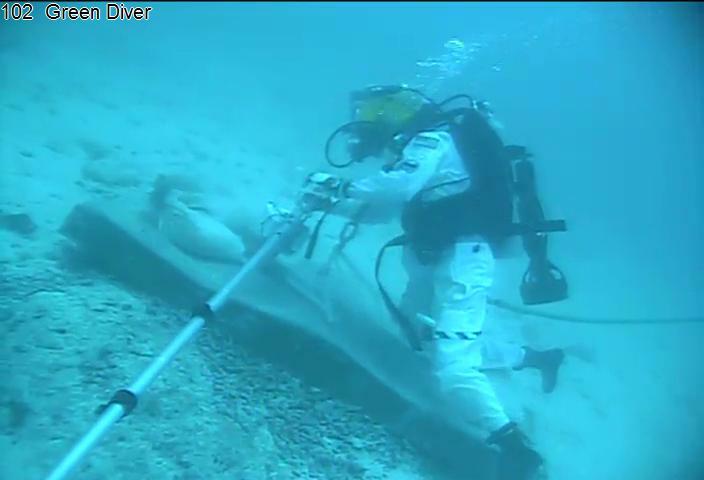 Learn more about the mission objectives and follow through live webcasts on the NEEMO website. 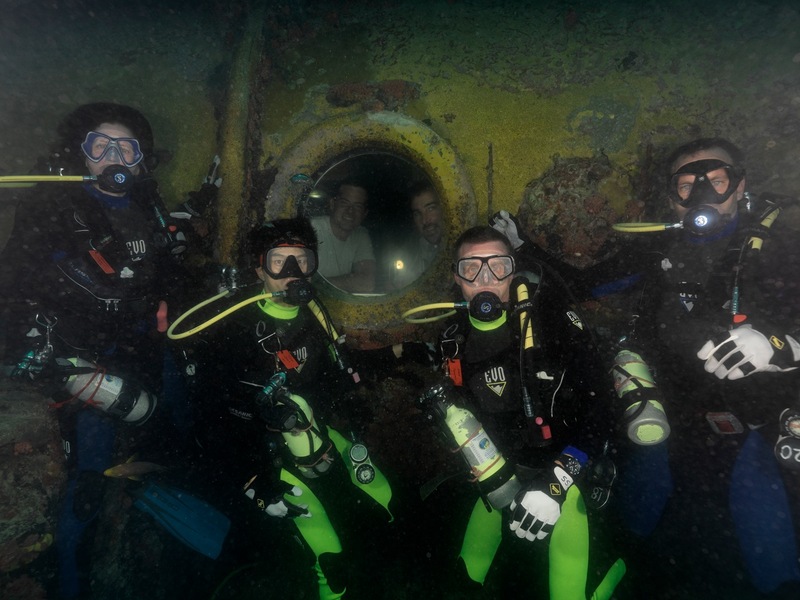 The training week for NEEMO 15 – the 15th mission of the NASA Extreme Environment Mission Operations (NEEMO) program – has successfully completed. The mission is scheduled for Oct. 17-29, however current severe weather has delayed the start of the mission until Thursday, Oct. 20 at the earliest. The mission is still expected to be a full 13-day mission. 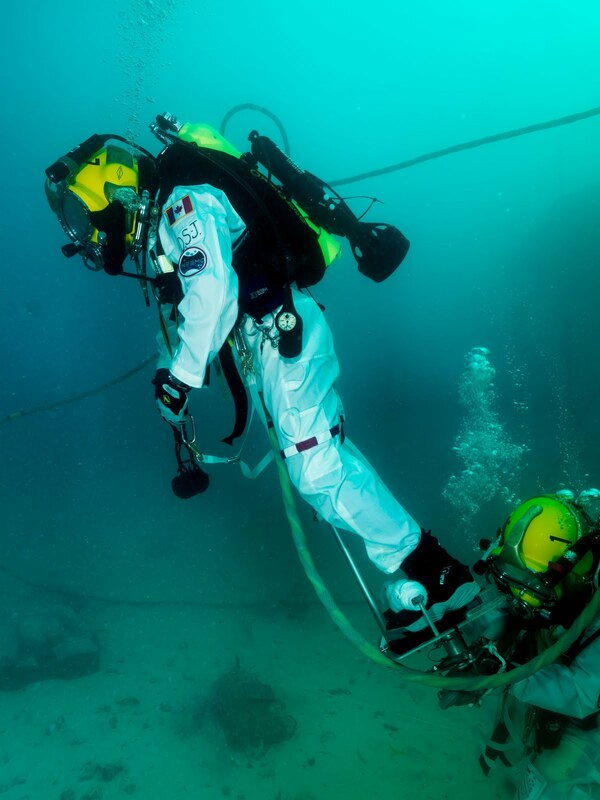 A core set of team members has been in place throughout the training week making final preparations for the mission, including deployment of equipment to the sea floor around Aquarius for the saturation crew to perform testing. 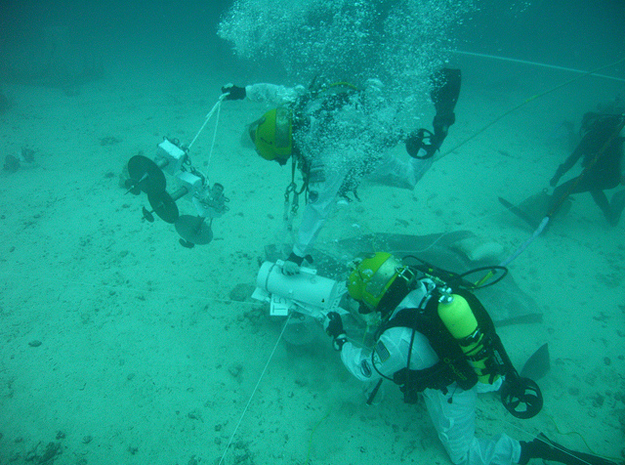 A circuit has been set up to evaluate different techniques for translation, sampling, and instrument deployment, including the use of Deep Worker submersibles as Space Exploration Vehicle (SEV) analogs. Additionally, on shore, the Mobile Mission Control Center (MMCC) has been set up and is ready to support offshore activities. Finally, a science team has been hard at work in preparation for the science traverse portion of the mission, which will run in parallel with the saturation crew performing NEA exploration activities. 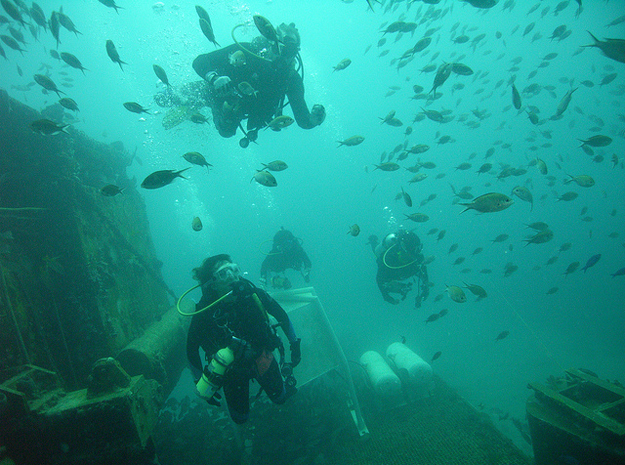 Portions of the week have been dedicated to dive training for the saturation crew as well as the topside support crew. 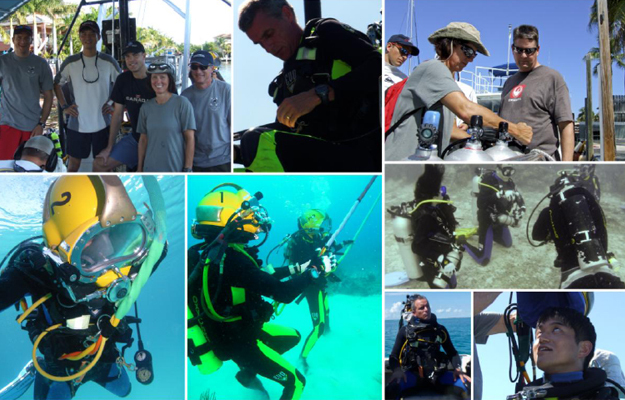 The saturation crew has received training on scuba and the SL-17 dive system that they will use on EVA from Aquarius. 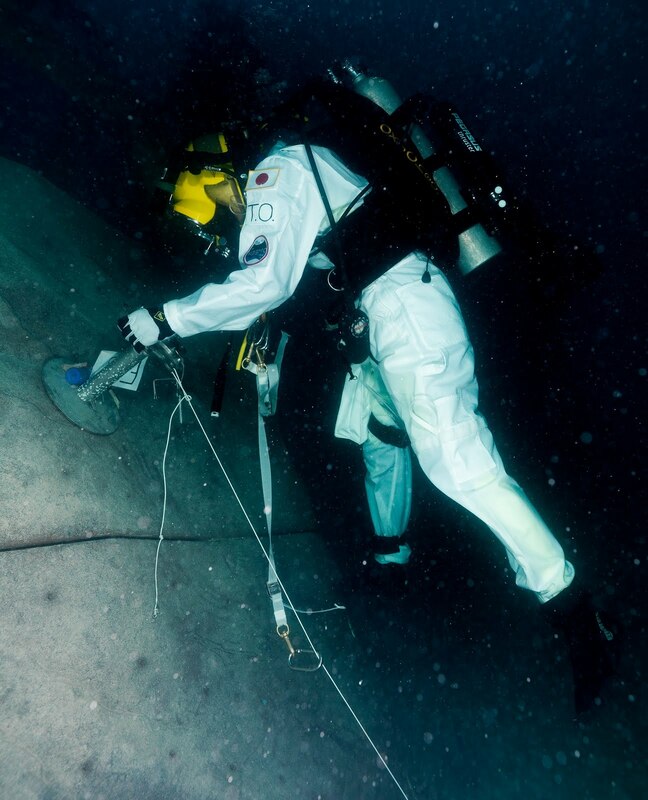 The topside support divers have received all necessary training to assist the saturation crew in the execution of their mission activities. 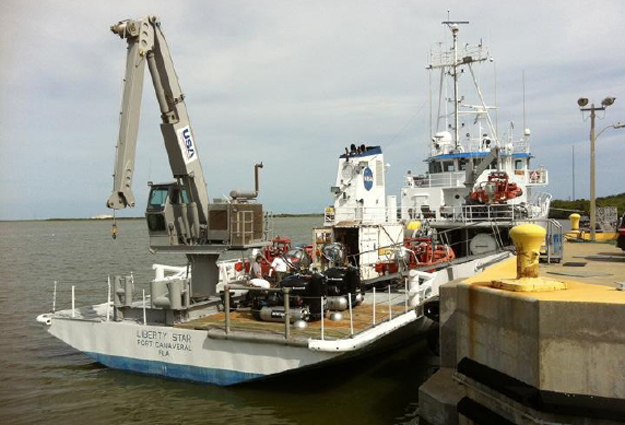 The Deep Worker submersibles on the Liberty Star in preparation for departure from Kennedy Space Center to Aquarius.